As expected, Maze Runner: The Death Cure will be doing most of its damage overseas. The franchise finale fell 57% domestically for $10.2M and $39M overall here, but has $137M worldwide which isn't too bad but far from what we saw from the prior chapters, each grossing well over $300M. 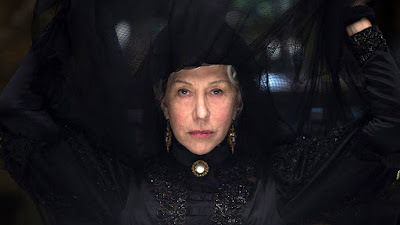 The only major release this week was the Spierig Brothers' horror, Winchester, a spooky ghost story starring Helen Mirren, Jason Clarke, and Sarah Snook. Yep, it's mostly an Australian production as you probably guessed based on the talent involved. Mirren stars as Sarah Winchester, the real-life heiress to the Winchester Repeating Arms Co., the rifle folks, who spent vast amounts of her fortune building onto her massive mansion because she believed she was cursed by those who had been killed by the family business. They didn't bother to screen the film for press so I paid for a ticket yesterday and the joint was practically empty. Obviously we were in the minority because a $9M launch isn't too bad for the small-budgeted thriller. At $137M, The Greatest Showman is now within whistling distance of La La Land's $151M for the biggest original live-action musical ever. Whoa.